TAIPEI (Taiwan News) -- A woman in southern Taiwan was found last week to have four sweat bees living in her eye and feeding on her tears, but the insects were removed before she suffered permanent damage to her eyesight. According to Liberty Times, a 29-year-old woman surnamed Ho (何) went with her family last week to sweep their ancestors' tomb in Kaohsiung's Daliao District during Qingming Festival (清明節) or Tomb Sweeping Holiday. While mowing the grass around the tomb, there was a strong gust of wind and she felt some "foreign bodies enter my eyes." She initially thought that it was just dust and did not rub her eyes, choosing instead to rinse them with clean water. Unexpectedly, after returning home, her left eye suddenly became inflamed and swollen like a "salted duck egg superman." Frightened, Ho rushed to Fooyin University Hospital, according to the report. Hung Chi-ting (洪啟庭), the ophthalmologist on duty, found that the cause of the swelling and redness in her eye was four "sweat bees" which had been hiding inside her eyelid. At a press conference, Hung said that when he was examining Ho's eye, he noticed what appeared to be insect legs. He grabbed one of the legs and carefully removed the insect to take a closer look. He found that all four insects were alive and he sent them as specimens to another organization to be studied further. The doctor said the bees were successfully removed from the patient's eye. He said that her visual acuity had deteriorated to 0.1, but after three days of treatment, it has improved to 0.8. 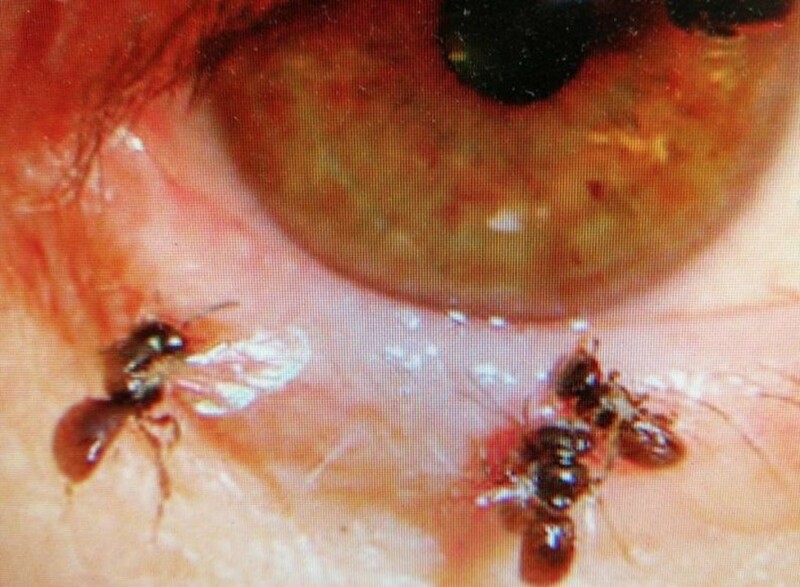 Hung said that to his knowledge this was the first case of sweat bees becoming lodged in someone's eye in Taiwan.